We would like to introduce you to Martin Hirschberg, a Canadian artist and sculptor, and his selected works, showings, “One Man exhibits”, commissions and current paintings. We offer personalized consultation by the artist for both corporative and residential buyers and act as a resource for Galleries, dealers, interior designers and consultants through formal presentations. Hirschberg has had more than 20 “One Man” exhibitions since 1961, major commissions and has garnered many awards for his work. Some of his works are included in the collection of the Art Gallery of Ontario and the Stratford Art Gallery. 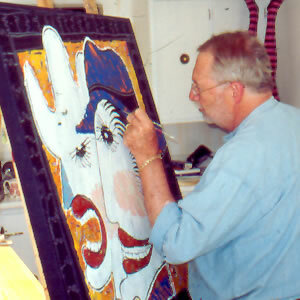 Martin's works are also included in private collections throughout Canada and the United States. He created the largest Kinetic mural ever created for The Research Centre Health Branch of the National Health and Welfare in Ottawa and a massive modular reflective sculpture for the Eaton's Center in Toronto that reacts to light and movement. For further information on Martin Hirschberg or to request a current exhibition list, or available works contact Martin Hirschberg at martin@hirschbergdesign.com or www.hirschbergdesign.com.